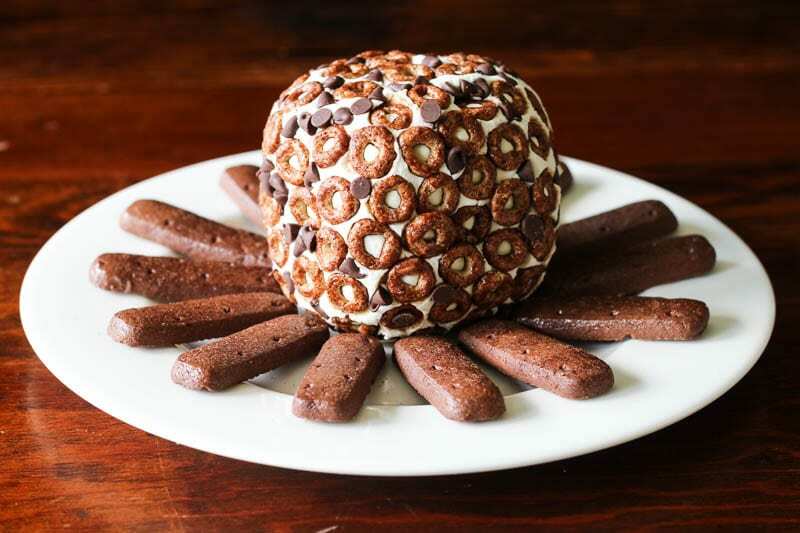 This delicious dessert cheese ball is made with cream cheese, chocolate, nuts, and Cheerios™. It’s the perfect dessert to share, and it makes everyone smile! Cheese balls were the celebratory staple of my childhood. It just wasn’t a holiday without some form of cheese that had been liberally anointed with crushed nuts and surrounded by an army of crackers. Usually, those cheese balls of yore were cheddar based; or, if you were lucky, someone had sprung for the fancy “port wine” cheese (my favorite). All those savory delights were a welcome addition to birthdays, Thanksgiving, Christmas, and New Year’s Eve. However, there was one thing missing. There was a never a sweet cheese ball. 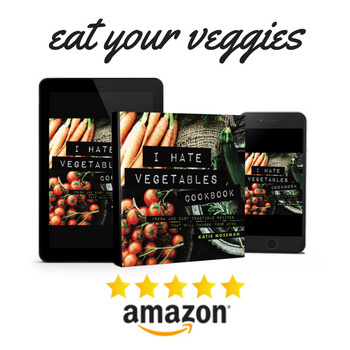 Since the kids have been home this summer, I’ve been racking my brain for activities to stave off the dreaded cry of “I’m bored!” Making recipes with the kids passes the time easily and lets them be creative as well. Inspired by those long-ago cheese balls, I’ve decided to make a sweet cheese ball version for the family to enjoy. It’s a pleasure to sit inside in an air-conditioned kitchen and have some fun while avoiding the summer heat outside! All you need are a few simple ingredients and some thoroughly washed hands. 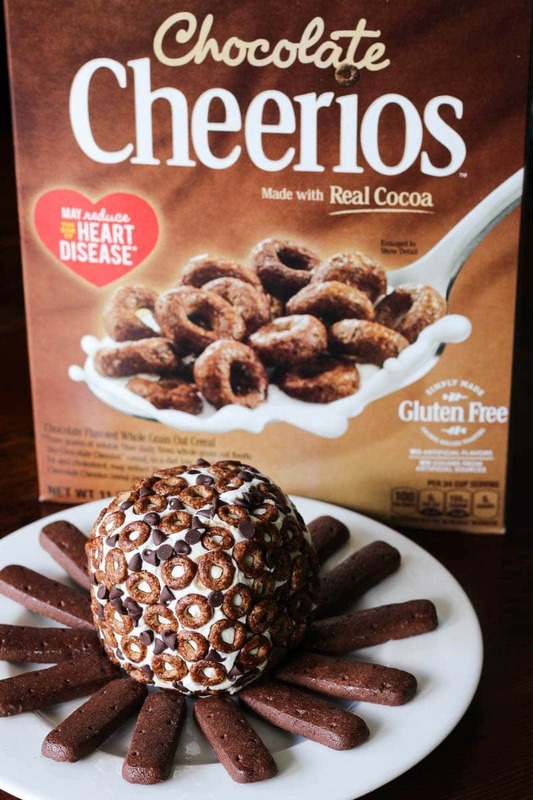 For this recipe, I’m using Cheerios™ from Walmart. They’re very easy to find in the cereal aisle. 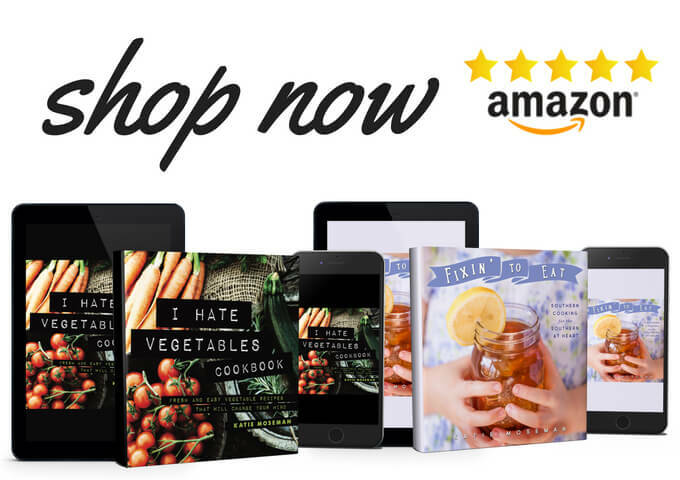 You can use this coupon to save even more! There are so many varieties to try. When you plan your shopping, you can also think about variations on this sweet cheese ball. Here are some ideas. Apple Cinnamon Dessert Cheese Ball: Cream cheese, dried apple chips, cinnamon, Apple Cinnamon Cheerios™. Trail Mix Dessert Cheese Ball: Cream cheese, Multi-Grain Cheerios™, raisins, peanuts, M & M’s. Fruity Dessert Cheese Ball: Cream cheese, a variety of dried fruits (cranberries, apricots, cherries, blueberries, etc. ), Fruity Cheerios™. 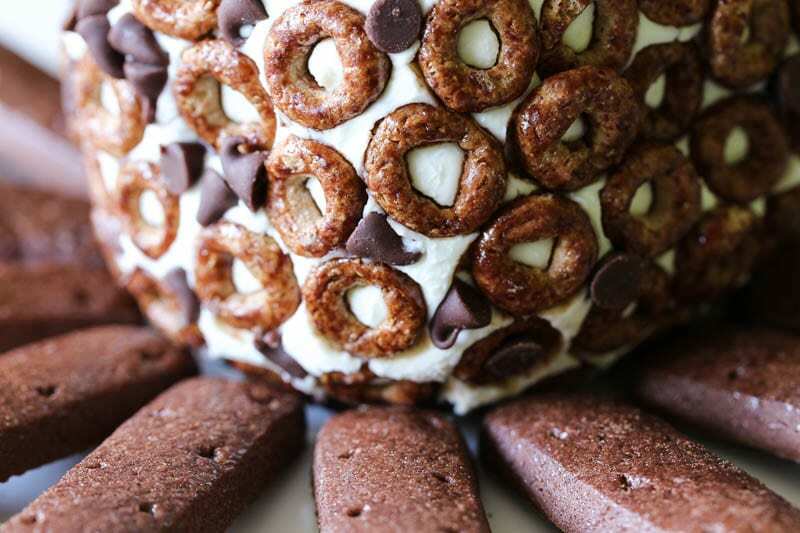 Beehive Dessert Cheese Ball: Cream cheese, honey, almond slivers, Honey Nut Cheerios™. I recommend setting up a workstation in your kitchen ahead of time so that you have all of your ingredients at hand. You don’t want to be holding a ball of cream cheese in your hand when you suddenly realize that you forgot to open the bag of chocolate chips. It’s much easier to form the ball when the cream cheese is very cold and firm. If you try to form a ball when the cream cheese is too warm and soft, it will be too squishy to handle. If you like, you can make any cheese ball into mini cheese balls. Just pinch off smaller amounts and roll them in the coatings just as you would a larger cheese ball. For parties, you can prepare the cheese ahead of time, and then roll the ball in the toppings at the last minute. 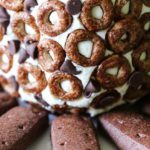 This delicious dessert cheese ball is made with cream cheese, chocolate chips, and Cheerios. It's the perfect dessert to share, and it makes everyone smile! Remove the cream cheese from the packaging and shape it into a ball. 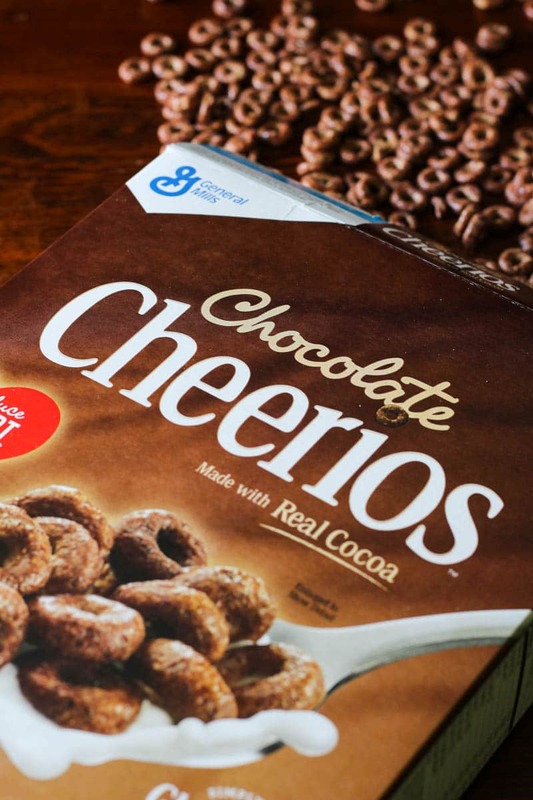 Press Chocolate Cheerios™ into the surface of the cheese ball one at a time until covered. Leave little gaps so you can also add mini chocolate chips. Press mini chocolate chips into the cream cheese gaps between the Chocolate Cheerios™. Serve with sturdy chocolate grahams or cookies for dipping. I have never thought about doing a dessert cheese ball. It’s a really good idea easy to make feed a lot of people. Thank you for the idea. I love making cheeseballs! We haven’t quite had one like this though, it sounds delicious! 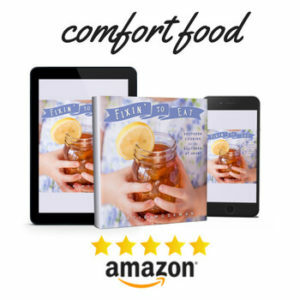 I will have to try this recipe soon! Cheese balls are one of my favorite things to make when hosting an event. Not sure I’ve ever heard of or tried a chocolate one. Oh wow! I love cheeseballs, but I can’t say that I’ve ever had a dessert cheeseball. I love the Chocolate Oreos on the outside. I love cheese balls, but I don’t think I have ever had a desert cheese ball before. This looks great for parties. This looks oh so delicious! I love cheese balls and haven’t had any type of cheese ball in SUCH a long time. Would love to give this one a try! This looks like an amazing cheese ball! I never have seen a dessert one before, what a greatidea! What a fun treat! I would really love to try this cheese ball! This is such a cool way to enjoy Cheerios. We always have some of this cereal on hand anyway. 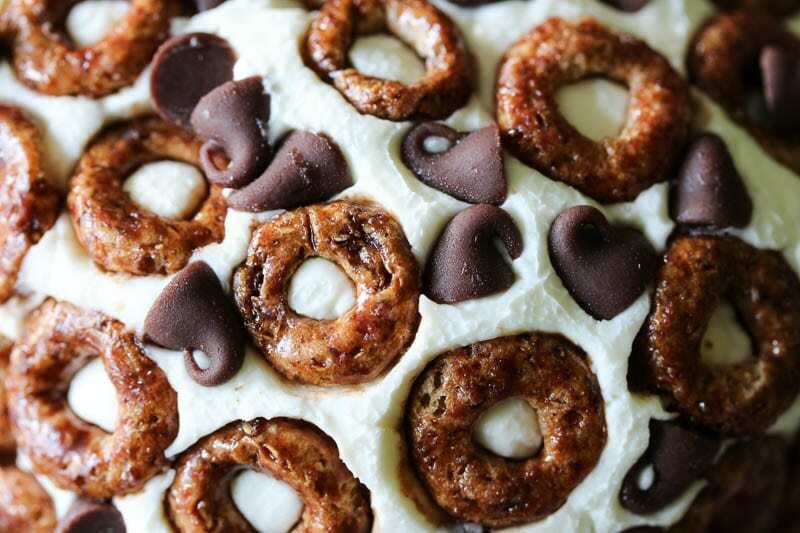 This looks super yummy, I will have to try to make this! Oh this would be the best thing for a party. That flavor combination sounds really good! This looks so good! I’d love to have a dessert cheeseball in parties especially this summer. It’s so quick to make and it’s really attractive. I’m sure the kids will love this as well. Awesome idea, thanks! The cheese ball dessert is indeed an awesome idea. 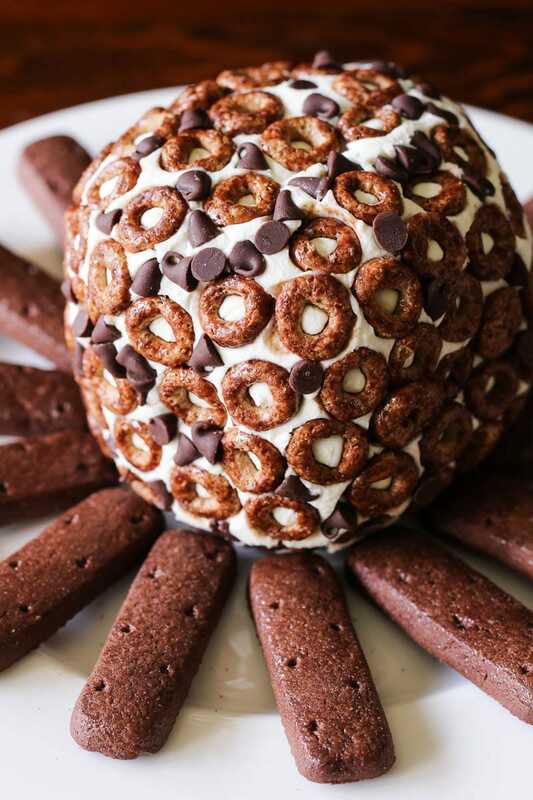 I have not yet tried the Chocolate Cheerios but will have to pick some up and make this cheese ball dessert. The kids would so love this for our gatherings. Thanks for sharing the recipe. This is a really nice desserts. it’s an awesome idea for the weekend with family and friends. This looks absolutely amazing. I’ll be making this very soon! Of course I see this recipe when I’m on a diet! I bet the rest of my family would enjoy it though. I have seen desert cheeseballs before but none that ever looked this good! I will definitely be making this bad boy soon!! Now I NEED to try this! Oh my goodness – as if I didn’t love cheese balls enough now you throw chocolate into the mix haha! It looks amazing! FREAKING. LOVE. THIS. So creative and delicious!!! What a fun idea, I know my kids would adore this. And I know it would go over well at any get-together with the whole fam!